John Griffin’s 13F portfolio increased from $7.75B to $8.43B this quarter. Blue Ridge Capital dropped Priceline & Air Products while adding Citigroup. The largest three positions are Autodesk Inc. (ADSK), Charter Communications (CHTR), and Facebook Inc. (FB) and they add up to ~18% of the portfolio. John Griffin’s 13F portfolio increased 8.82% from $7.75B to $8.43B this quarter. Recent 13F reports have shown a total of around 55 positions. The largest five stakes are Autodesk Inc. (ADSK), Charter Communications (CHTR), Facebook Inc. (FB), CDK Global Inc. (CDK), and Amazon.com (AMZN) and they add up to a quarter of the entire 13F portfolio. Citigroup Inc. (C): C is a fairly large 2.91% portfolio stake established this quarter at prices between $43 and $48. The stock currently trades well above that range at $60.70. Amazon.com Inc. (AMZN): AMZN is a top-five 5.05% of the portfolio position established in Q1 2016 at prices between $482 and $676. Last quarter saw a ~50% increase at prices between $586 and $728 and that was followed with another ~20% increase this quarter at prices between $716 and $837. The stock currently trades well above those ranges at $768. Teva Pharmaceuticals (TEVA): The TEVA stake was a very small at 0.92% of the portfolio as of last quarter. The position was disposed of this quarter at prices between $46 and $56. 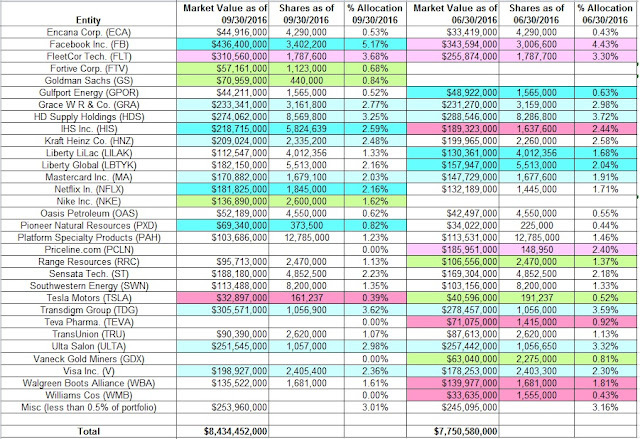 It was a ~3% of portfolio position established in Q4 2015 at prices between $56 and $66. Last quarter saw a two-thirds reduction at prices between $48.53 and $57.25. The stock is now at $37.27. Fairly large stakes in Air Products & Chemicals (APD) and Priceline (PCLN) were dropped this quarter as well.